For 30 years, Arts for the Aging has been a pioneer in the design, development, and delivery of artist-led, multi-disciplinary, participatory arts programs that are specially designed to improve the health and enhance the quality of life of older adult groups, in community and residential care settings, who are living with mild to moderate physical and cognitive impairments, and who may not otherwise have access to these kinds of therapeutic life enrichment interventions due to affordability, availability and ability to use such programs. 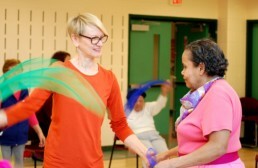 AFTA was founded on a premise that studies, years later, now show: that regular participation in the arts by older adults helps to minimize aging-related physical and cognitive impairments, and contributes to better physical, intellectual and emotional health. AFTA’s service is comprehensive, diverse and flexible, allowing partners to focus on the delivery of safety-net services, activities of daily living, and occupational and physical therapies. By providing a frequent source for high-quality arts interventions, we offer reliable and cost-effective therapeutic innovations that minimize strains on health and economic resources, and maximize well-being and productivity of older adults. Our curriculum consists of visual, musical, performing, literary, multidisciplinary and intergenerational arts experiences. Older adults living with health-related challenges experience our signature one-hour arts sessions in small groups of about 20 in size. 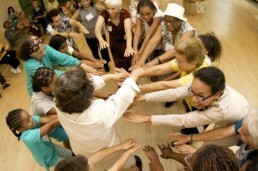 These experiences are self-contained: exposing participants to rotating artists and media each week, emphasizing physical and cognitive abilities, honoring changing needs, validating potential, integrating cultural richness and igniting socialization — all so vital to creating community and feelings of belonging. Quicksilver is Arts for the Aging’s dance improvisation company comprised of independent adults aged 60 and over. 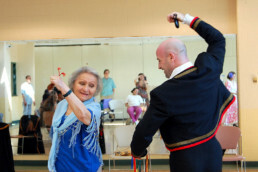 In weekly rehearsals, company members develop mastery as performers and expertise in the use of dance as a methodology for engaging with other older adults. 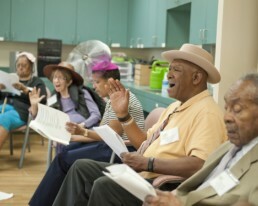 During programs in healthcare settings and senior centers throughout the Washington D.C. area, the company uses its art form to enliven their more frail peers, to “begin a conversation”, with participants who learn to make their own creative movement responses. These dances are usually accompanied by live music. The experience is about active artistic engagement and self-expression, which are at the heart of AFTA’s person-centered care approach. Everyone has a creative capacity. This program uses an interdisciplinary approach in artistic engagement to accommodate diversity, process, and enticement of participants to put their artistic expression in words, drawing, painting, and sculpture. Using visual art, poetry, story and movement in various combinations, participants connect to their imagination, each other and themselves. They learn about poets and artists while engaging in discussions, writing collaborative stories and poems, and making individual art work. 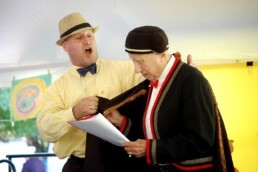 Explore the world of opera with a professional tenor. Participants will experience musical selections and live performance from their favorite operas while learning about music, sharing stories, dressing in costume, moving to music and, of course, singing. Poetry, literature and other writings of the day spark conversation and draw on life and cultural experiences as guides for developing poetry, stories and personal responses. Both individually and collaboratively, participants explore themes such as change, growing older, family, seasons, memories, loss, and new beginnings. Participants take part in interactive dance works, interspersed with music and stories about the history of the blues. All are encouraged to share in a celebration of life and mystery. 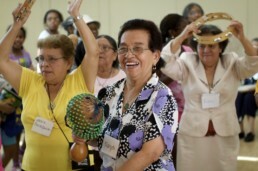 Experience the fundamentals of choreography in this interactive dance workshop for older adults. Starting with a physical warm up to enhance movement, alertness and discovery, participants will explore music, poetry, visual art and photography to awaken memories, connect to our individual movements, and to share story. This intergenerational program series pairs students with seniors to learn digital photography and videography with iPad technology while exploring artful techniques for capturing one another on film. The students interview the older participants about their lives and create a culminating video. Through theater games, role-playing and reenacting scenes from favorite plays, participants will explore language and movement. In doing so they uncover new aspects of themselves while experiencing “being in someone else’s shoes”. Using free form movement, participants create dances to reflect thought, emotion and memory, and that are enhanced by props that vary in texture, color and shape. The dance-making is a group effort, and there is observation and reflection on everyone’s creativity. Classical music and Big Band selections promote an atmosphere for reminiscence and ease of movement. 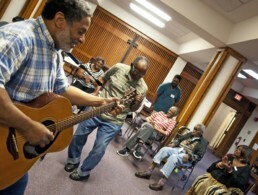 Through storytelling, songs and movement, participants share their life stories. Program activities such as visualization, theater exercises, and group sharing bring memories to vivid life in the senses, body, voice, emotions, and mind. Participants are encouraged to reminisce about events and themes in their lives with personal, psychological, political, historical or cultural significance. An energetic but gentle movement experience to lively music that encompasses health, well-being, and self-expression. Techniques include guided imagery, for better movement and expressiveness. Music, movement, rhythm, song and lyrics can be infused into our daily lives. Entering through the world of opera this program will encourage participants to conduct, rap, dance, sing and express through music, led by acclaimed Soprano Fairouz Foty. Playing with movement and expression while creating choreography. Using individual props of different textures and shapes, dancers will experience a variety of energy dynamics. Simple activities like singing combined with gesture alternate with more energetic movement, allowing for a customizable challenge level. This workshop will awaken your senses, increase your range of movement and ignite new friendships with peers. Music and dance from Spain and Latin America come to life with dynamic performances and colorful costumes. Marla and Peter perform and encourage program participants to sing, move and dance with them, individually and with partners. Participants also use musical instruments and costumes for a festive atmosphere. By viewing artwork and sharing observations and responses, participants consider various ways that art reflects universal themes and life experiences. During this shared creative process, each person may express their own interpretation of artistic themes, ranging from the inner world conveyed by a portrait to the beauty and wonder of nature portrayed in landscape paintings from ancient China or desert scenes by Georgia O’Keeffe. Our deepest memories are attached to music. This program uses songs familiar to participants to spark conversations about the ups and downs of life. 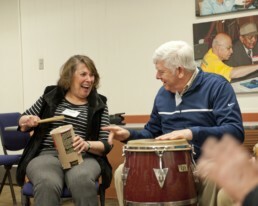 When singing, dancing, and discussing the songs, participants enjoy nurturing the person they are underneath the obstacles aging can bring to their lives. Lyrics of Life explores all genres, meeting the participants where their interests lie. Experience some of the best-loved musicals of the 1940’s, 1950’s, and beyond, through historical overview, dramatic storytelling, spontaneous role play and singing along to songs from each musical. Musicals includeSouth Pacific, Music Man, My Fair Lady, Oklahoma, The Sound of Music, Fiddler on the Roof, Damn Yankees, West Side Story, Annie Get Your Gun, and others. Create intoxicating rhythms on a wide variety of percussion instruments that make you want to move your body! While Wall Matthews leads an energetic drum circle, Deborah Riley encourages standing or seated movement. Sing along to favorite songs and participate in call and response singing. This program is guaranteed to invigorate participants physically and wake up their minds. Moving Art is a series of workshops centered around viewing and critiquing a theme in early 20th century art, such as “abstraction,” and the creation of artistic responses to selected works, through movement and gestural drawing. They will explore those themes in music and dance using rhythm, space, shape, juxtaposition and energy evoked by the paintings. Gestural drawing is used to discover can capture on paper the connection between movement and art. Explore exciting rhythms from a variety of cultures with Chris Brown (bass player) and Manny Arciniega (percussionist). The musicians create musical landscapes using recorded loops and encourage participants to groove along with a selection of handheld percussion instruments. 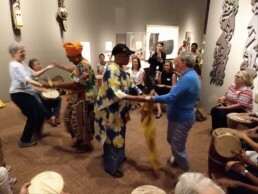 Explore drumming techniques from Africa on a variety of percussion instruments. These irresistible rhythms are then blended with popular music of the early to mid-20th century, and other favorite songs as identified by the participants. Dancing strongly encouraged! Create original works of art using a variety of materials! Artist Marcie Wolf Hubbard guides participants in creating collages and memory boxes using “up-cycled” material such as post cards, paper scraps, fabric and jewelry. Drawing from an extensive musical repertoire, including popular, folk, jazz, blues, patriotic, spiritual and seasonal songs, participants will sing, dance and share stories about the significance of music in their lives. World-class cello player Tobias Werner invites participants to take a closer look at the second largest instrument of the string family. Performance of pieces both classical and modern are interspersed with discussion about composers, music styles and periods, and the emotional reactions music inspires.